When it comes to chocolate beer, I am always pretty skeptical. Usually these types of beers are too sweet for my liking, so they are not a priority of mine. I must give props to Samuel Adams, however. Their Chocolate Bock is surprisingly good — and not too sweet at all. According to the Sam Adams website, the Chocolate Bock was slowly aged on a bed of rare cocoa nibs (including some from Ecuador). These cocoa nibs give the beer a very prominent, but not overwhelming, chocolate flavor. Poured into a glass, this is a very dark beer. This has a sweet taste, but not overly so. The Chocolate Bock would be an excellent choice for a rich dessert pairing or some actual chocolate. As such, it would be difficult to have more than one glass of this. 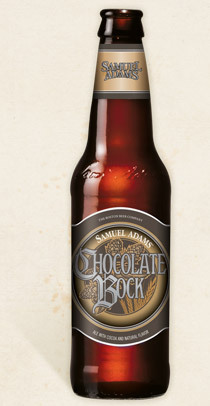 I enjoyed Samuel Adams’ Chocolate Bock, but I wouldn’t go out of my way to have it again. Chocolate lovers will enjoy this brew, but be careful where you buy it. Apparently this bad boy costs $15 for a bomber, and that is a bit too steep of a price. I had a regular 12 oz bottle in a Sam Adams variety pack, and that is the way to go here. Give it a try if you are curious about it. My friend is a bar manager, so he has a hook-up with distributors. Last year, he got several of these and we drank them during a marathon of Edgar Wright’s ‘Spaced’. It was one hell of a day. And I loved the beer. Like you, “chocolate” gives me pause, but this was a lot like eating chocolate cake, WITHOUT being overpowering. That’s quite an accomplishment. That sounds like an awesome day. I haven’t seen Spaced myself, which is a bit of a travesty since I have enjoyed Wright’s films quite a bit. Just from the little bit I have heard about it, the show sounds like it would great to pair with some beers.